When I am asked “where are you from?” my automatic response is “Birmingham.” I was born in a military hospital at Fort Benning across the Chattahoochee River from Alabama in the final days of my father’s military service. But my parents are from Birmingham, both sets of grandparents lived there, and I moved there when I was a month old. My father’s work frequently moved the family while I was growing up so I left Birmingham three times in my growing up years and moved back three times between birth and age 15. During all my years in Tuscaloosa at the University, I was less than an hour away and was in town frequently. I also had one enjoyable stint living in Birmingham as an adult for four years in the early ‘90s. If the right opportunity presented itself, I’d gladly move back. I’ve lived away from Birmingham more than I’ve lived in Birmingham but it is always “home” to me. And those of us who call Birmingham “home” are a strangely loyal and proud bunch. The allure of the city is not always apparent to people who don’t know the place but I am always intrigued by the affectionate responses I get from displaced Birminghamians around the country. When I was young my parents would talk about being young marrieds in Chicago in the early ‘50s – Dad was military and Mother worked for an insurance company – and running into people from Birmingham in Grant Park and other Chicago locales. The energy of the talk would escalate if the Birminghamians happened to be from Ensley, my dad’s old neighborhood and the place where he and Mother met. When I was working in Texas, I met an older theatre volunteer who had been born and raised in Birmingham and her eyes would glisten as she fondly recalled growing up in the city. She had not returned since she got married and stranded in Texas 42 years earlier. When I was going home to Alabama for the holidays, she asked me to bring her back a six-pack of Buffalo Rock, a strong and spicy dark ginger ale that originated and is still made in Birmingham. 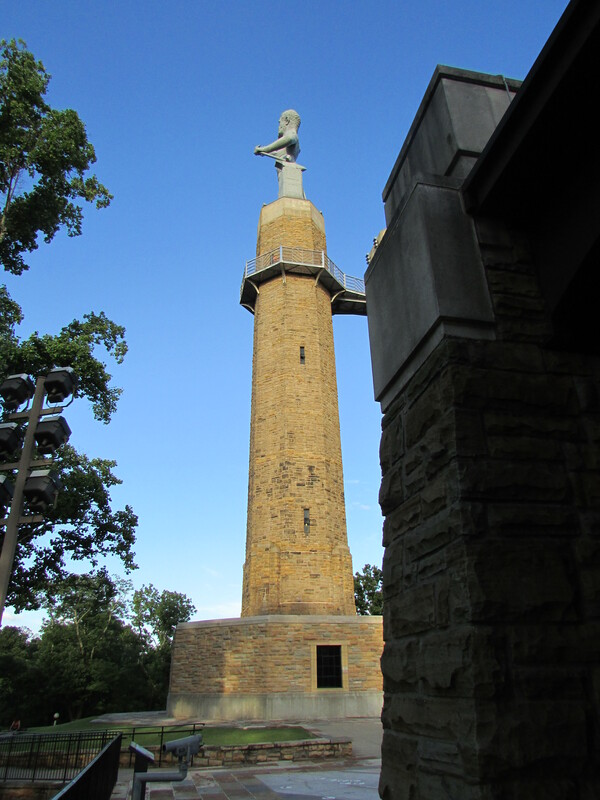 These memories are sparked by a visit to Vulcan Park this evening (www.visitvulcan.com). 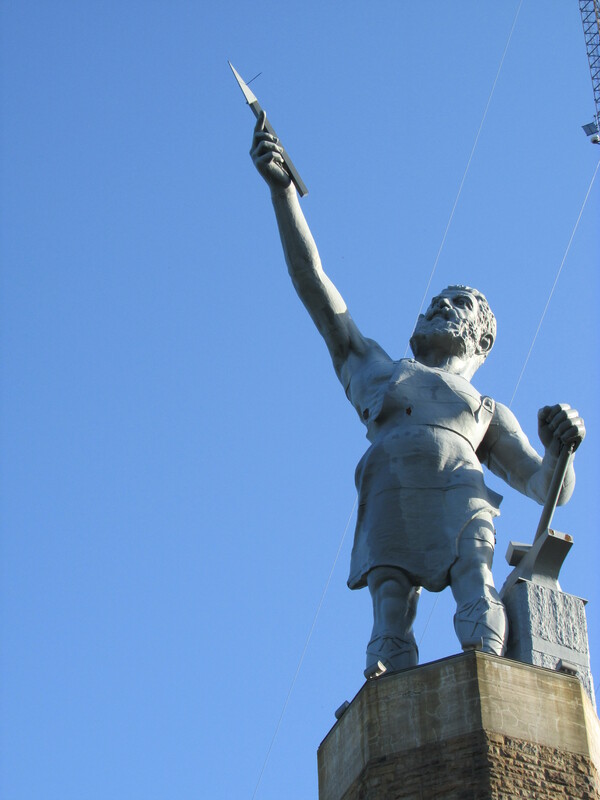 Vulcan, the Roman god of the forge, is the symbol of Birmingham and the representation of the city’s industrial history. A 56 foot tall iron statue of Vulcan overlooks the city from a 123 foot tall stone pedestal atop Red Mountain. Vulcan atop his perch is visible from locations throughout the city and whenever I return to Birmingham I always look for my first glimpse of Vulcan from the interstate. Vulcan means “home” to me. Vulcan made his debut as Birmingham’s exhibit in the 1904 St. Louis World’s Fair. The city was only 33 years old at that time and had already become the industrial center of the South. Civic leaders commissioned the colossus from sculptor Giuseppe Moretti and it was fabricated with iron from the Birmingham area. Vulcan was a popular attraction in St. Louis, winning a Grand Prize. Vulcan is a burly, bearded guy standing next to his block and an anvil with a hammer in his left hand. In his right hand he holds a newly forged spear point aloft. He is naked except for a blacksmith’s apron. The apron partially covers him in front but his back is bare with buttocks exposed. Before a recent restoration, he was angled on his pedestal so that his back side was aimed toward Homewood, a suburb just over the mountain from Birmingham, and Vulcan was affectionately called “Moon over Homewood.” His current angle finds his back side aimed more toward the television stations that share the mountain with him and The Club, an exclusive private dining club that looms over the city like an embedded spaceship. I like the idea that he moons The Club. On his return to Birmingham after the St. Louis Exposition, Vulcan was homeless for a while and was reassembled at the Alabama State Fairgrounds in Five Points West. The original spear point had gone missing and Vulcan at the Fairgrounds became an advertising tool, holding aloft such things as an ice cream cone, a Coca Cola bottle, and a pickle sign. In the 1930s the WPA built the park and pedestal on the mountain where Vulcan has resided ever since. Starting after World War II and continuing through my childhood, Vulcan held aloft a torch that was a safety beacon. It burned green if there had been no traffic fatalities in the city and burned red for twenty-four hours after a local traffic fatality. It was a kitschy idea but as a young boy I would always check the torch color. As a child I liked to be on Vulcan’s observation deck around sunset when the sky around the city would turn golden orange as molten iron was poured into blast furnaces. 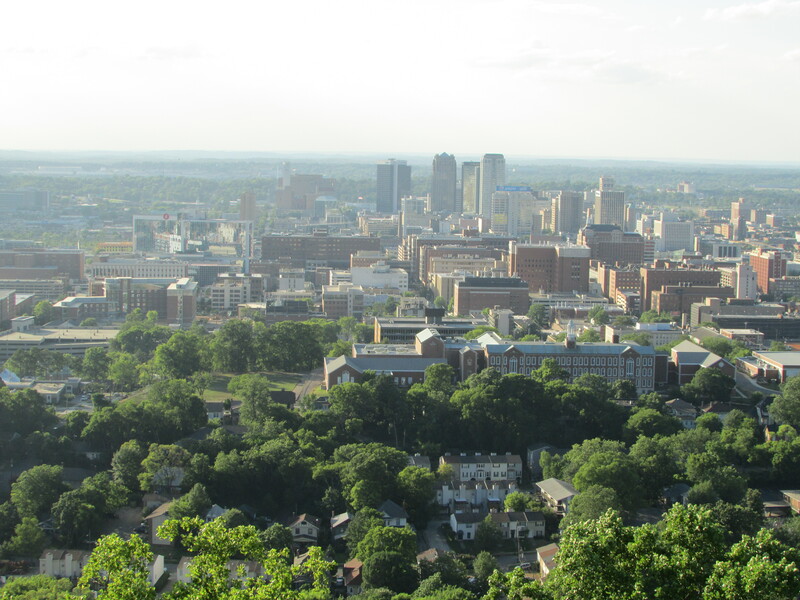 All Birmingham knows that on the 4th of July “if you can see Vulcan, you can see the fireworks” and thousands gather around the city on both sides of Red Mountain to catch the annual Independence Day fireworks display. As a kid, we usually watched from a hill in front of the Belcher house in the western section on Bessemer Superhighway. In the ‘70s the park had a major overhaul that resulted in a lot of the original character of the WPA-built park and pedestal being sacrificed. The observation deck near the top of the pedestal was enclosed so one still had sweeping views of the city but couldn’t look up at Vulcan. The beautiful stone of the pedestal was hidden by cladding. 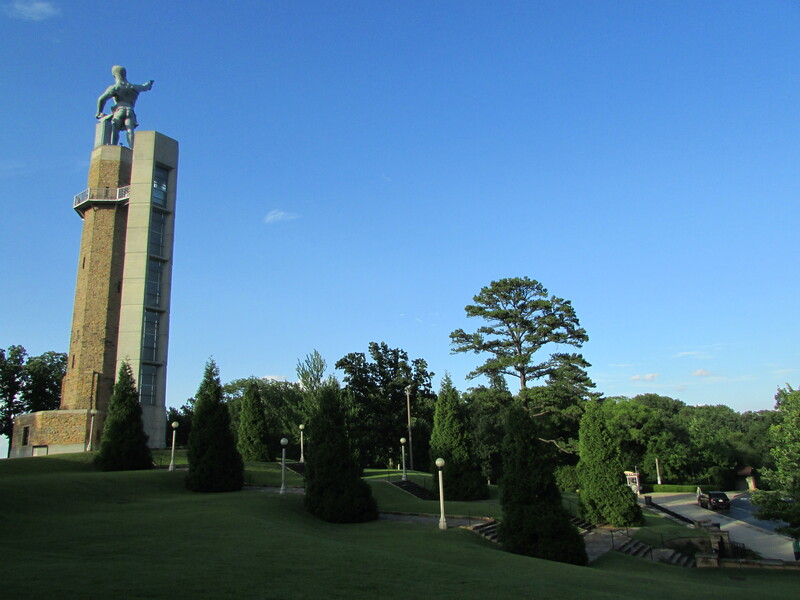 Finally, in the late ‘90s, the Vulcan Park Foundation was founded and money was raised to remove and restore Vulcan to his original design, including the restored spear point in the uplifted hand, and to reclaim the 1930s beauty of the WPA’s stone work and design on the pedestal and grounds. Vulcan was back on his pedestal in 2003 and the park reopened to the public in 2004. Vulcan looks better than ever and the park is a beautiful place with a visitors center and a museum with permanent exhibits as well as changing ones. A multitude of informational displays and narratives are placed throughout the grounds and it is a unique and special place to learn about Birmingham’s vibrant and colorful industrial history. There are still remnants of mine entrances and trestle beds in the park and along the paths. Any proud Birmingham boy or girl should know exactly to whom that label refers. This entry was posted in Vulcan Park Birmingham and tagged 1904 St. Louis World's Fair, Alabama State Fair, Birmingham industry, Birmingham Red Mountain, Buffalo Rock ginger ale, Coca-Cola, Giuseppe Moretti, The Club Birmingham, Vulcan, Vulcan Park, Vulcan Park Foundation, Vulcan Statue, WPA on June 20, 2015 by gedwardjourney.